A young man enters ER with chest pain . . . 1 , 2 , 3 . . . and get him out of ER ! For ruling out acute coronary syndrome in in men less than 40 years , here is 30 second protocol ! 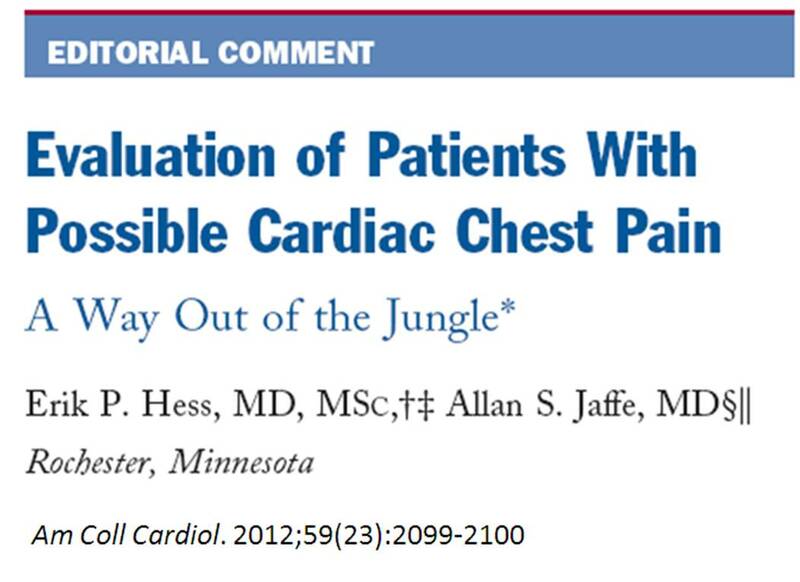 Please note cardiac enzymes are not required to R/O ACS in this group ! 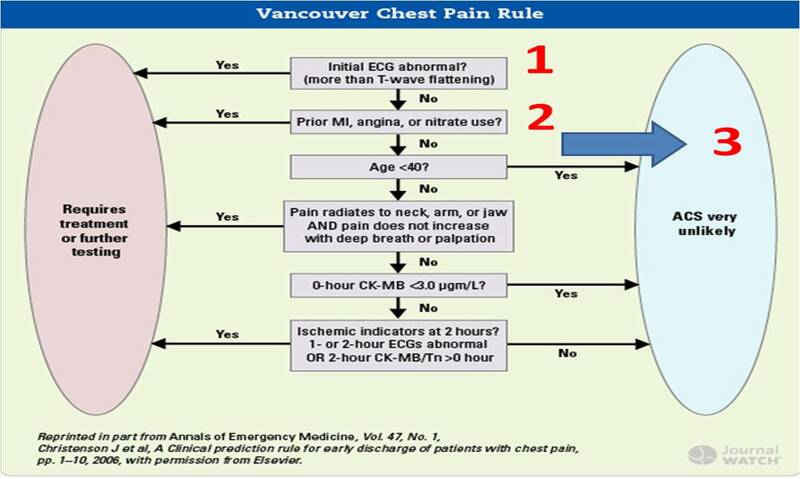 Vancouver chest pain rule is a glorified clinical sense ! Non compaction of AV node : The curious electrical “archipelagos” and risk of fatal bradycardias ! 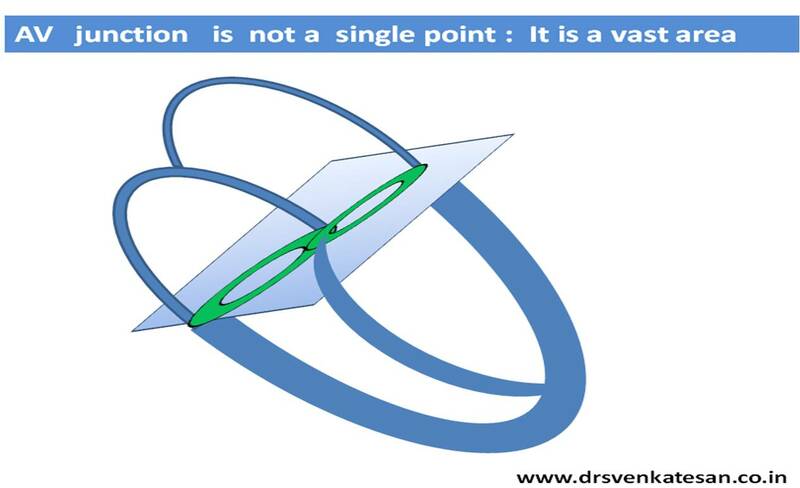 AV nodal tissue is a not compact structure as we would be believe . But it is a fact , AV node do attempt to compact after birth. Note the islands of his bundle entrapped . Image source : M. Paz Sua´rez-Mier J Am Coll Cardiol 1998;32:1885–90 From the Section of Histopathology, Institute of Toxicology and †Department of Pathology, La Paz Hospital, Madrid, Spain. 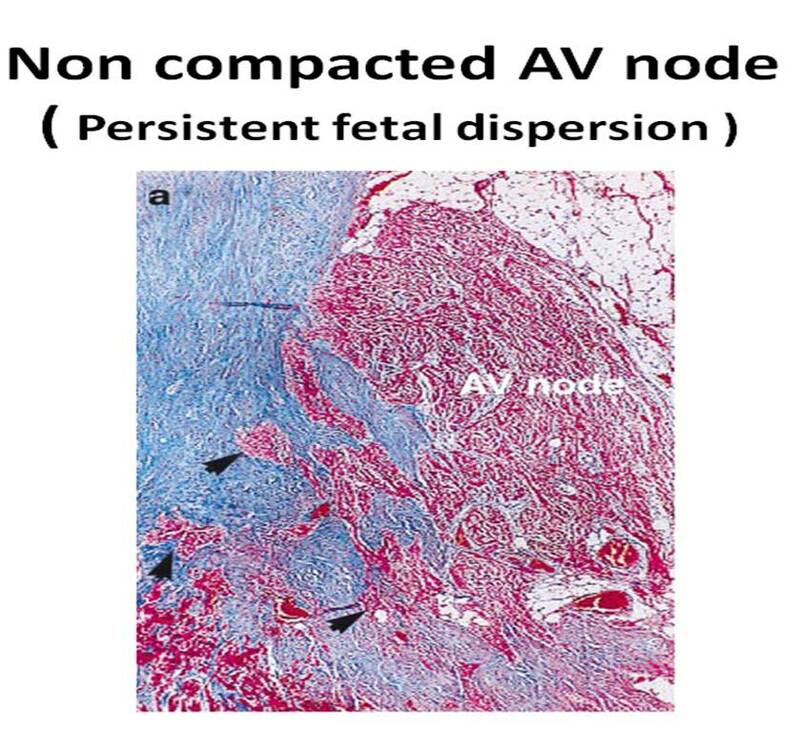 This failure of AV nodal compaction is termed as persistent fetal dispersion of AV node . In the his bundle same phenomenon is called as his bundle de-fragmentation .These abnormalities are noted in pathological specimens of Pokkuri sudden death in Asians . Unexplained sudden deaths and instant bradycardias and complete heart blocks are related to these dispersion of AV nodal cells downstream . This also explains some of patients with infra hisian escape show junctional characteristics. Many cardiac pathologists have observed this . Still there is a missing link . Kirschner RH, Eckner FAO, Baron RC. The cardiac pathology of sudden,unexplained nocturnal death in Southeast Asian refugees. JAMA 1986;256:2700–5. Hudson REB. The conducting system: anatomy, histology and pathology in acquired heart disease. In: Silver MD, editor. Cardiovascular Pathology. New York: Churchill Livingstone, 1991:1367– 427. James TN. Normal variations and pathologic changes in structure of the cardiac conduction system and their functional significance. J Am Coll Cardiol 1985;5:71B– 8B. James TN, Marshall TK. De Subitaneis Mortibus XVIII. Persistent fetal dispersion of the atrioventricular node and His bundle within the central fibrous body. Circulation 1976;53:1026 –34. Persistent Fetal Dispersion of the Atrioventricular Node Association With the Wolff-Parkinson-White Syndrome Claude Brechenmacher, MD; Jean-Paul Fauchier, MD; Thomas N. James, MD Arch Intern Med. 1980;140(3):377-382. 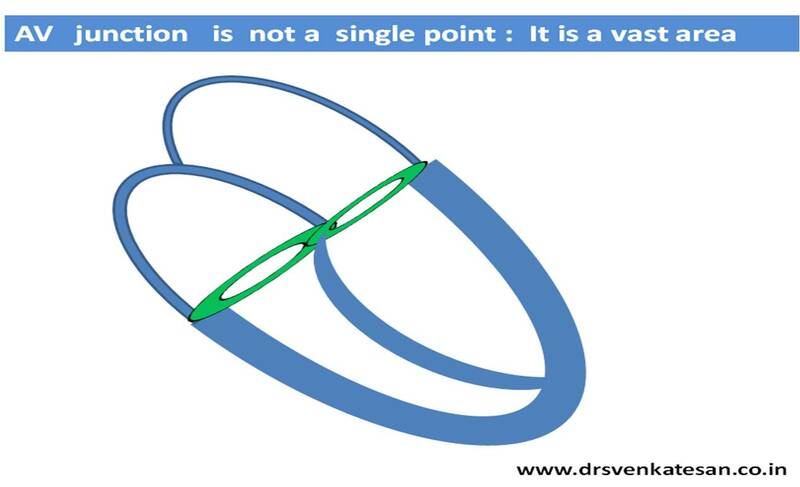 AV junction is not a single point : It is a vast area ! Why Junctional rhythm has huge variation in P wave morphology ? Further ,the appearance and timing of P waves will be determined by the underlying structural heart disease also. 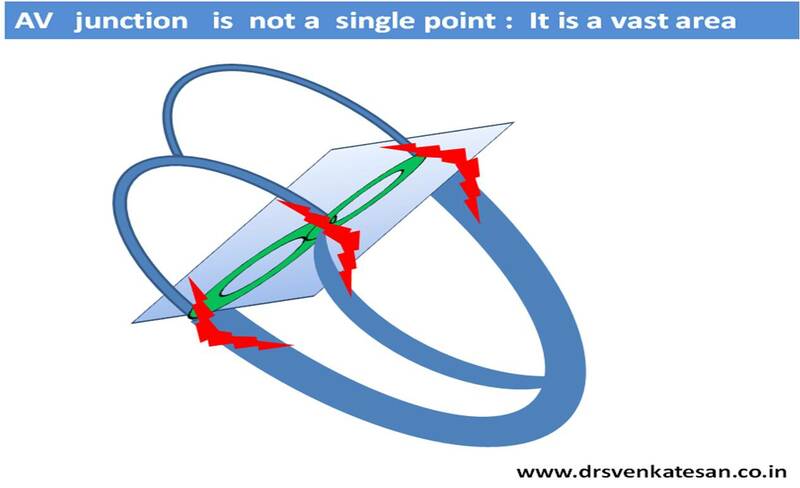 Medical students have grown up with the belief that AV junction is a single focused point .It is true in terms of electrical circuitry of normal AV conduction .However during pathological electrical disorders ( Which arise often because of structural disorder) it should be realised the AV junction is a huge plane . Arrhythmia can occur anywhere from this plane .The entire plane can become electrically active which may also acquire the ability to conduct bi-directionally . What is the mechanism of pericardial effusion in hypothyroidim ? Hypothyroidism is a classical example of generalised edema formation . The mechanism of which is extensively studied .Still we are not clear about it . Albumin leak into interstitial and extra cellular space due to capillary dysfunction. Reduced lymph clearance – probably due to poor lymphatic tone . Why hypothyroid edema does not pit on pressure ? For pitting to occur tissue should be compressed and retain the elasticity .This means the fluid can escape into the cell when mechanically compressed and comes back when the elasticity of skin brings it back to its original status. For this to occur the skin and subcutaneous matrix should be normal in texture. In cardiac failure and renal failure edema is primarily due to altered hydrostatic forces and skin is intrinsically normal .So some amount of pitting is retained . In hypothyroidsim and lymphedema where there is an intrinsic pathology of the skin pitting is rare. Why constriction and cardiac tamponade are rare with hypothyroid pericardial effusion ? Like the generalised slow response of hypothyroid individuals the effusion is also very slow forming and is rarely large so tamponade is rare . The hypothyroid infiltrates which collects within the pericardial space it rarely infilitrates the fibrinous pericardium (The thick outer shell ) .Unless fibrinous pericardium is inflamed or infiltrated constriction is exceedingly rare .Simple epicardial infiltration may cause some restrictive physiology but not constriction . Innovation in Interventional cardiology : Catheter retrival of infective vegetation and mobile clots from cardiac valves and chambers ! Intra cardiac foreign bodies are frequent occurrences in clinical cardiology practice. The common ones are intra chamber clots , vegetations and rarely tumors. Some of these masses are very mobile are precariously attached to the cardiac strutures . It becomes a cardiac emergency as a major embolic event is imminent . While surgery remains the mainstay approach in such situations , now it seems possible to trap these mobile masses with help of catheter and retrieval devices safely. The only issue is , while retrieving these masses it should not be let into the circulation and result in embolisation . For this we can develop a porous net (Fishing net like ) that can be blown in the distal chamber or Aorta . Devices can be structured in way that a single catheter can be used with different ports to capture and filter and retrieve the mass . ( vacuum enabled suction catheters can be additional option ) .The whole procedure can be accomplished with fluroscoy and fluroscopic guidance . Intra cardiac echocardiography might also contribute . This innovation will be a great value addition to the interventional cardiology armamentarium ,would be be appreciated by clinical cardiologists . 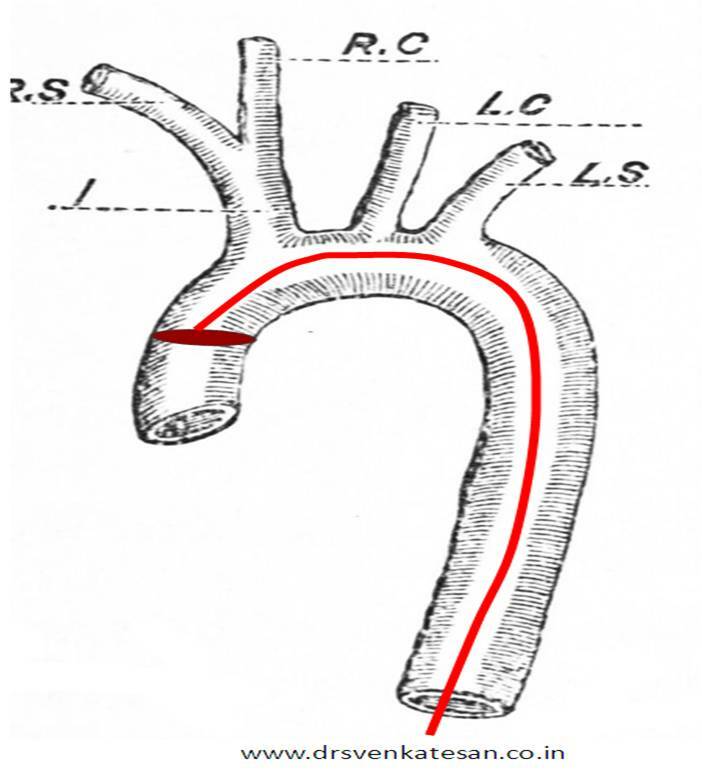 We in our tertiary teaching hospital have felt the need for a such a device quiet often .Currently many patients land up in surgical tables for the sole purpose of removing these clots and vegetations .Similarly left atrial clots becomes a contraindication for percutaneous mitral commissurotomy(PTMC) . Such capture devices can be very useful.